Overview: In this activity, children will have the chance to create a pair of play binoculars from simple materials! 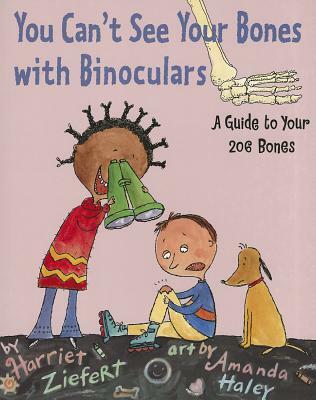 They can craft their binoculars and then read a story such as You Can’t See Your Bones with Binoculars by Harriet Ziefert or Andy Shane and the Barn Sale Mystery by Jennifer Richard Jacobson and feel actively involved with the text. Place one toilet paper roll along the short edge of the construction paper. Roll the paper around the toilet paper roll one and a half times. Hold the paper there and use your pencil to make a mark on the paper, like in the picture below. Unroll the paper and draw a straight line across the paper from the mark you made. Cut along the line. Fold the rectangle in half. Cut along the fold. Along the long edge of the new rectangle, use the black marker to color a border. Color a border on the other rectangle too. Place the toilet paper roll along the short edge of the red rectangle and roll the paper around it. Glue (or tape) the paper where it overlaps. Repeat with the other toilet paper roll and red rectangle. Both toilet paper rolls should look like the ones in the picture below. Apply glue on the toilet paper rolls where the paper overlaps (see the picture below). Then, press the two toilet paper rolls together. Hold them together for 30 seconds. Set aside and let dry. While you let the toilet paper rolls dry, take the last red rectangle that you have and fold it in half. Fold it in half again. Unfold the paper. You should see that you have made 4 rectangles out of folds (see the picture below). Cut out one of the rectangles. Color it black with your marker. Roll this rectangle and glue it where the paper overlaps – just like you did with the red paper and toilet paper roll. Let it dry. While you let that dry, you can carefully punch holes in the toilet paper rolls. Use the hole puncher to make a hole about halfway down the outside of each toilet paper roll. Feed one end of the string through one hole and tie a knot. Feed the other end of the string through the other hole and tie another knot. This book tells the story or Andy Shane who wants to raise enough money to buy a binoculars case for his grandmother’s binoculars. But that is only until the binoculars go missing! Andy will go on a search for the missing binoculars. This mystery book is a great choice for young readers ages 5 and up.